The red-breasted nuthatch (Sitta canadensis) is a tiny bundle of energy. Long-billed and short-tailed, these songbirds usually stick to tree trunks and branches, searching the furrows for insects. The bird also collects resin globules and spreads the sticky substance around the entrance to its nest hole. It may carry the resin in its bill or on pieces of bark that it uses as an applicator. The resin may serve to keep out predators or competitors. The birds avoid touching it by diving directly into the hole. The name nuthatch is derived from "nut-hack," which refers to its habit of hacking or pecking open nuts by wedging them between bark crevasses and hammering them open with its bill. The bird darts up, down and sideways on a tree, traveling fast and changing direction often and easily. Northernmost populations migrate south each year, but other populations may not migrate at all. 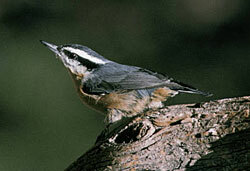 The red-breasted nuthatch can be irruptive in years when cone production is poor on their breeding grounds, moving southward in great numbers.